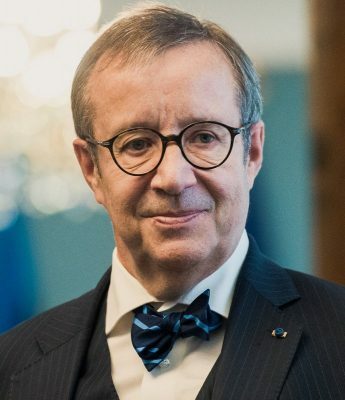 Toomas Hendrik Ilves served as the fourth President of Estonia from 2006 to 2016, previously served in the government as Minister of Foreign Affairs from 1996 to 1998 and again from 1999 to 2002. He was key in driving the initiatives in e-government and cyber security for which the country has been acknowledged as a world-leader. From 1993 to 1996, Ilves served in Washington as the Ambassador of the Republic of Estonia to the United States of America and Canada. During this time he initiated with education minister Jaak Aaviksoo the Tiger Leap initiative to computerize and connect all Estonian schools online. In 2004, Ilves was elected a Member of the European Parliament, where he was vice-president of the Foreign Affairs Committee. As an MEP, he initiated the Baltic Sea Strategy that later was implemented as official regional policy of the European Union. During his presidency, Ilves was appointed to serve in several high positions in the field of ICT in the European Union. He served as Chairman of the EU Task Force on eHealth from 2011 to 2012. From 2012 to 2014, at the invitation of the European Commission, he was Chairman of the European Cloud Partnership Steering Board. From 2014 to 2015, he was the co-chair of the advisory panel of the World Bank’s World Development Report 2016 “Digital Dividends” and since June 2014, the chair of World Economic Forum’s Global Agenda Council on Cyber Security. Since November 2016, Ilves has co-chaired the Global Futures Council on Blockchain Technology, a working group set up by the World Economic Forum focusing on how blockchain technology can be used to improve the security of the internet. His interest in computers started at an early age – he learned to program at the age of 13, and he has been promoting Estonia’s IT-development since the country restored its independence. During recent years, Ilves has spoken and written extensively on integration, trans-atlantic relations, e-government, cyber security and other related topics. He has published many essays and articles in Estonian and English on numerous topics ranging from Estonian language, history and literature to global foreign and security policy and cyber security. Having realized just how important the early adoption and acquisition of digital skills were before many others did, President Ilves was named the World Leader in Cybersecurity with his contributions by the Boston Global Forum and the Michael Dukakis Institute on December 12, 2017 at Loeb House, Harvard University.